UPDATE: Video Added! I’ve been messing with clave independence for a while now. If you’re interested in getting into this, be forewarned–it’s going to take a lot of time to get this independence to a point where it will be useful. It’s pretty difficult. But, as with all drumming stuff, time will yield rewards. Nothing’s impossible. Not even this. The worksheet I’ve created and am offering to you here is a template for you to begin working on independence with the clave rhythm. All of the basic 16th note variations are written out with the clave rhythm notated above them. Note that you can use this worksheet in many different ways. I have been working on these exercises myself in order to develop the clave independence with my cymbal hand. That means I want to be able to play clave with my right hand and have freedom to play anything I wish with my other limbs against that. You can choose to use the exercises differently if you wish. The best alternate way of using this PDF I can think of is to work on left foot clave. To do this, you’d just use the top line as the line you play with your left foot, and use the second set of notes for any other limbs that you choose. Personally, left foot clave is not for me, but if you want to go there, have at it! Please feel free to ask any questions in the comments for this post. Thanks for your tips and tricks. I’ve followed you for some time now, and think you’re doing a good job. However, much of your stuff that doesn’t come with a video clip, showing what its supposed to sound like, doesn’t help me, because I can’t read drum notes. 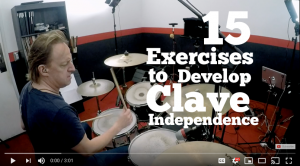 So I can’t really get that much out of this independence clave excercise, because I don’t really know how that should sound. I’ve tried to learn to read drum notes, but it’s no use. I can understand some drum notes in its simpliest form, like quarter notes, eight notes, simple 4/4, and so forth. But then with all other dots and thingamabobs, it gets too hard for me. I therefore feel like I’m missing out on a lot of stuff because I can’t read drum notes. There is now a video for this Clave lesson. I hope it helps. I STILL think you need to work on reading, but hearing this will make things easier…. Thank you for your kind words. I’m glad you’re finding the material helpful. Regarding the reading of rhythmic notation…. You’re right! If you want to be really good at playing drums, I think it is essential that learn to read rhythmic notation as it applies to drum set. You simply can not learn efficiently if you don’t understand it. Stop trying to teach yourself. You probably need to go take some lessons in person with someone who can teach you how to read this stuff. You CAN learn it. It just may not be something you can teach yourself. Go find a good teacher…..any drum instructor who is competent can help you with this. Thanks again for reading the blog and good luck in all of your drumming endeavors.